This resource is provided for free as a public resource by Smart Home America, Inc. There are two versions of the "Code Supplement". One for coastal communities and one for inland. Both are supplemental codes to the International Residential Code (IRC) 2009, 2012 or 2015 and later editions that will be created and may be adopted by jurisdictions and municipalities. 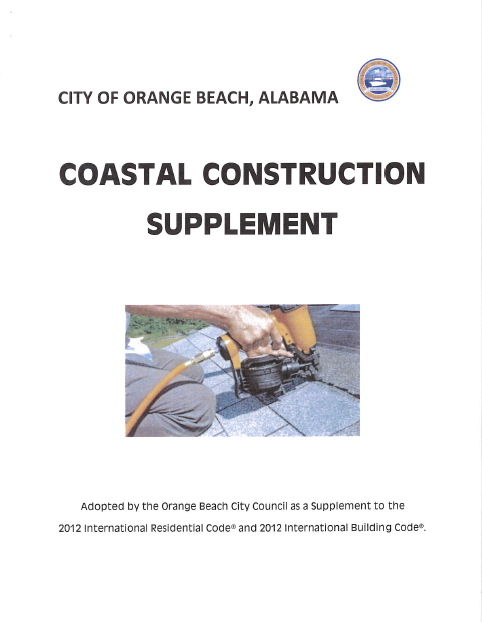 The idea for the Construction Code Supplement came from community leaders and Building Code Officials in Coastal Alabama, in partnership with Smart Home America, after being impacted by both Hurricanes Ivan and Katrina in back to back years. 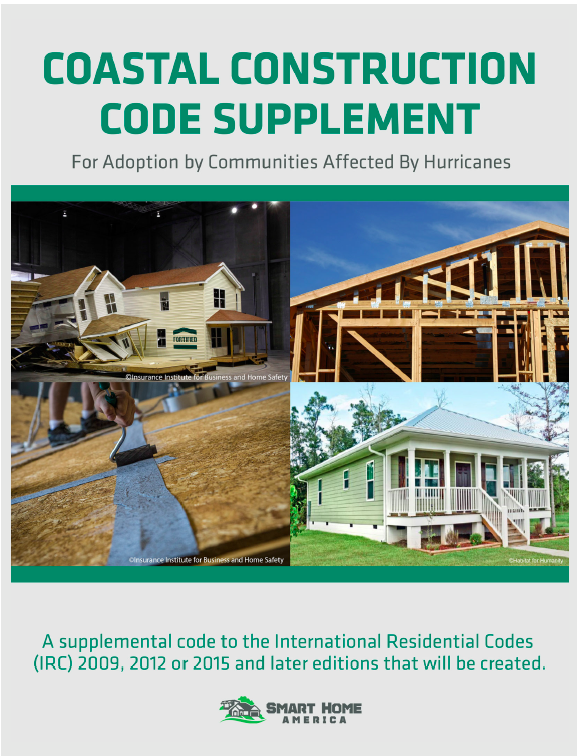 The purpose of the Code Supplement is to increase community resilience and reduce future damage from hurricanes, high winds, hail, severe storms and wind-driven rain. Adoption has many benefits including; reduction of losses during severe weather events significantly reduced damage, and lowered insurance costs. A recent study also shows that a FORTIFIED Home™ designation increases the resale value of a property. Additional benefits of using and enforcing this supplemental code are increased numbers of FORTIFIED Home™ designations and reduced storm debris cleanup costs. 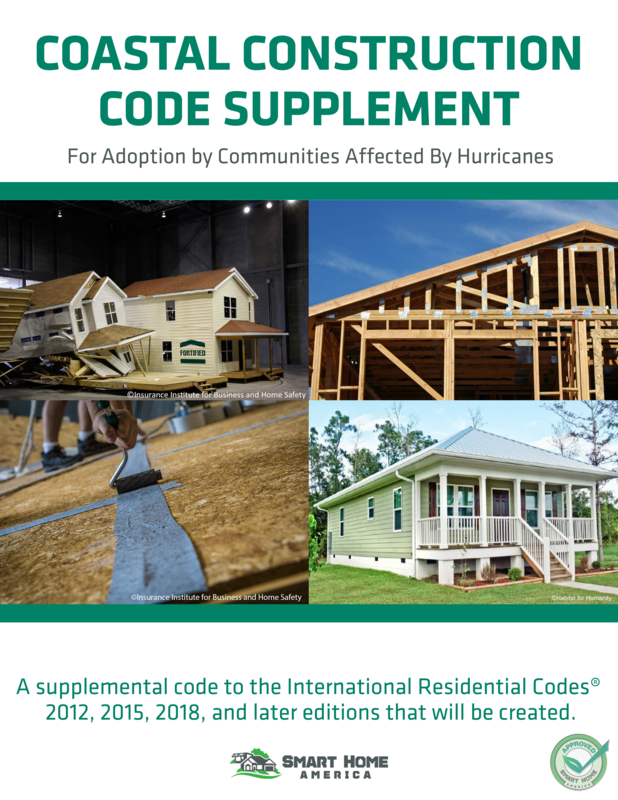 Adoption of the Code Supplement closes the gap between existing “I Codes®” and the Insurance Institute for Business and Home Safety’s (IBHS) FORTIFIED Home™ Technical Standards. The Code Supplement is meant to be adopted and enforced in addition to local building codes. IBHS provides technical input to keep the Code Supplement current. The Supplement is based on the latest research and testing conducted at the IBHS Research Center and in the field. To connect with communities enforcing this supplemental code, please contact Smart Home America at 1.855.742.7233 or info@smarthomeamerica.org. Additionally, Smart Home America strongly advises the adoption of the 2015 IRC/IBC flood-resistant construction standards. Flooding is one of the most devastating and shared hazards facing communities today. By incorporating added steps to mitigate against wind and flood hazards, the durability and strength of homes can be increased while bolstering the safety of residents. Learn about the cost-effectiveness of using hurricane-resistant home improvements as outlined in P-804 here. This Job Aid establishes the use of pre-determined benefits to demonstrate the cost-effectiveness of wind retrofit projects that comply with FEMA P-804, Wind Retrofit Guide for Residential Buildings. This eliminates the requirement for Applicants/subapplicants to conduct a separate benefit-cost analysis for a hurricane wind retrofit project that meets the criteria identified. Download the FEMA P-804, Wind Retrofit Guide for Residential Buildings here. If jurisdictions or municipalities have any questions about how to modify or adopt the Supplement, please contact us.